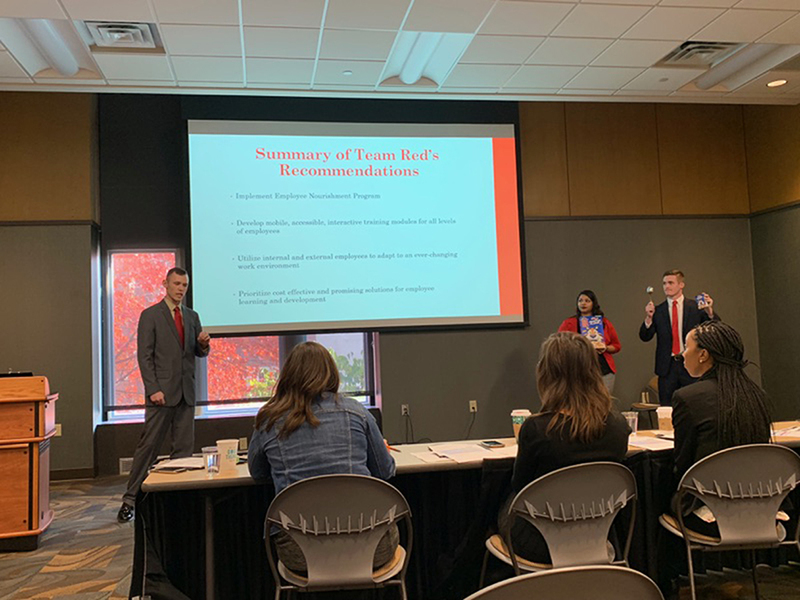 WIU-QC Students competing in the Krannert Human Resource Case Competition at Purdue University were (L-R) Bryce Stotler; Debbie Claeys; Olivia Jimenez; and Andrew Gerdes. Stotler, left, received the Best Individual Contributor Q&A Award in the undergraduate category and received a $500 prize. MOLINE, IL -- Six Western Illinois University-Quad Cities students participated in the 2018 Krannert Human Resource Case Competition and Executive Dinner on Nov. 8 at Purdue University. Team members included Bryce Stotler (Colona, IL), Debbie Claeys (Atkinson, IL), Olivia Jimenez (Bettendorf, IA), and Andrew Gerdes (Moline, IL). Stotler received the ‘Best Individual Contributor Q&A Award' in the undergraduate category and was awarded a $500 prize. Alexis Russell (East Moline, IL) and Jacob Benson (Rock Island, IL) provided assistance. The case competition is an opportunity for students to compete while sharing creative solutions with business leaders. WIU-QC's Society for Human Resource Management (SHRM) members applied and were accepted to the competition. "The team analyzed a business case related to a real Human Resource issue, and presented their solutions to a panel of HR executives who currently work at Amazon, Kellogg's, Phillips 66, and Polaris," said Susan Stewart, professor of human resource management and SHRM advisor. "There were roughly 100 students competing, from schools including Cornell, Purdue, and BYU." For more information on Western's Human Resource Management major, visit wiu.edu/academics/majors/business_and_technology/human-resource-management.php .